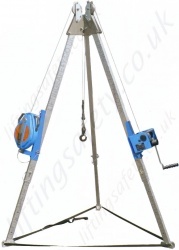 Height safety Tripods are used for confined space entry and egress including rescue from height applications. Tripods have three leg and are made from lightweight aluminium so that they can be easily transported between locations and quickly set-up ready for use. The right choice of equipment to be used on the tripod depends on what the user needs to achieve. We offer a many products including man-riding winches for lifting persons, inertia reels for arresting a fall, retriever blocks for arresting the fall then rescuing afterwards.